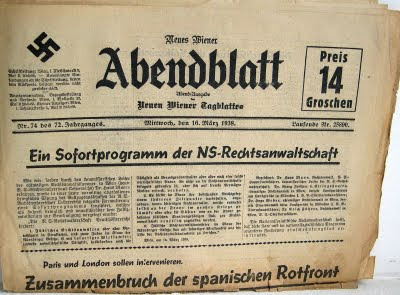 I recently bought this newspaper, published in Vienna on March 16, 1938, at the weekly flea market held at the Naschmarkt. It was printed during a historic time for Vienna. On March 12, 1938, German troops had marched into Austria, an invasion that met no resistance. A day later, Hitler had declared the union of Germany and Austria, in effect annexing the country into Germany. On March 14th, he had been excitedly and warmly welcomed to Vienna. 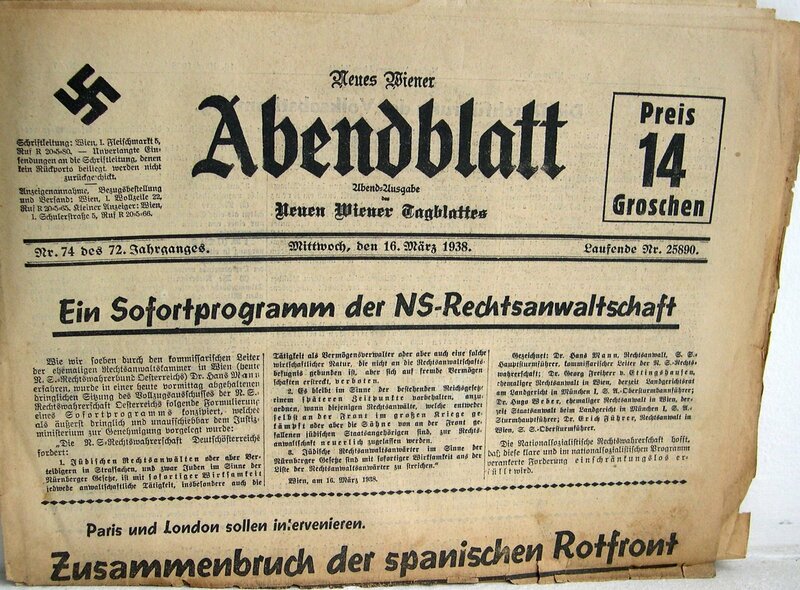 The front page on this March 16th newspaper has an article by Joseph Goebbels reporting that Hitler was returning to Berlin and urging its citizens to turn out to greet him in his triumph. Also on the front page, as shown in the picture, is an edict from Nazi "justice" officials stating that Jews would no longer be able to work as lawyers or have a role in the judicial system of the country. This action was the first of many to come that persecuted Vienna's Jewish citizens. By the end of World War II, almost all of the 170,000 Jews who lived in Vienna in 1938 had either been murdered by the Nazis or had emigrated. On the second page is a headline stating that Major Emil Fey and his family had killed themselves. Fey had been a close associate of Prime Minister Dollfuss, and in 1934 had been commander of the right-wing's (Austro-fascist) para-military organization, the Heimwehr. He had been a military leader in the 1934 civil war in which the government and Heimwehr forces had destroyed the Austrial socialist party, and had either killed or scattered its leadership. As a nationalist, Fey had also led actions to repress the Austrian Nazi Party. Many historians believe that Fey and his family did not commit suicide, but were killed by the Nazis in retaliation for his earlier treatment of members of the party. On one level, this paper can be viewed as an interesting historical item that tells of a difficult time. On a deeper level, it is a disturbing and troubling artifact because we know that it is the beginning of a new period in Austrian history that would result in the death of hundreds of thousands of its citizens; the murder of tens of thousands of people, including many its citizens; and a stain on its history that will never be forgotten.